Jewel Blessing Buddha in auspicious red coral and lucky turquoise ! SIDDHARTHA BUDDHA, THE BUDDHA OF ENLIGHTENMENT (TRADITIONALLY KNOWN AS GAUTAMA BUDDHA) IS AVAILABLE IN OUR BRASS BUDDHA STATUE COLLECTION AT BUDDHA BAZAAR AS PART OF OUR VISIONARY WORK BY OUR ARTISTS. BUY SITTING BUDDHA, 12 INCHES GAUTAMA BUDDHA IDOL IN EXQUISUITE HAND CRAFTED BRASS, EMBELLISHED WITH RICH BLUE TURQUOISE AND RED CORALS. BUY BUDDHA STATUE ONLINE ! Brass Buddha Statues ,Buddha Idol in Buddha Bazaar ! The Buddha of Enlightenment is the founder of Buddhism, also known as "The Awakened One". The Buddha while fasting under the Bodhi Tree attained Nirvana, or the ultimate form of divine knowledge. A Gautama Buddha Idol alleviates suffering and brings purity to the soul by improving your karmic flow, which contributes to a better universe. This Brass Buddha Statue will radiate positive spiritual energy to aid you in following the Middle Path of the Buddha .Today the Buddha is the Fountain Head of all knowledge.Let it become part of your shrine for every day prayers or as a decorative symbol of your lifestyle. 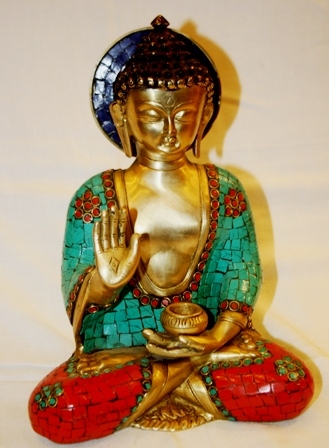 Buy Sitting Buddha Statue in 12 inches Brass Cast, embellished with beautiful turquoise and corals, handcrafted at Buddha Bazaar by our local artists. The monastic garbs are in a beautiful semi-precious stones and the Buddha holds the Vase of Alms in his hand which signifies the humility of a wandering Sage. His right hand extends out in Blessing Mudra to shower his kindness and love. Let it be your own Energy Statement for your Family. Buy Buddha Statue Online from our online store, Buddha Bazaar and pray with our special Buddhist incense as part of our free gift with this item. Height: 12 inches, Length: 08 inches. Gift included: Special Buddhist Incense Sticks. Like the information on our Jewel Blessing Buddha, visit us here for more information on Buddhism. *HOW BIG IS MY STATUE..? ?